This post is by Amy Jane Wells. Well, today we are visiting family, I'll do better tomorrow. Well, today we are camping, I'll do better tomorrow. Well, today I got out of bed late and only had 10 minutes to read, I'll do better tomorrow. The excuses keep piling up and will if I continue to let them. Yesterday, I sat down intending to "search" better than usual. I have been reading in the book of Revelations trying to understand the overwhelming amount of symbolism. I had a question and thought, "Oh, that's probably one of those questions that may be answered in a couple of years." So, I read on, "But can't I check cross references now to see if my answer is there?" I concluded to go back and check the cross references and get over the fact that I may not be able to complete the chapter today. As I checked the references, I realized my answer was there in the Doctrine and Covenants. Wow! So, simple questions can be answered in a few short minutes? Amazing! 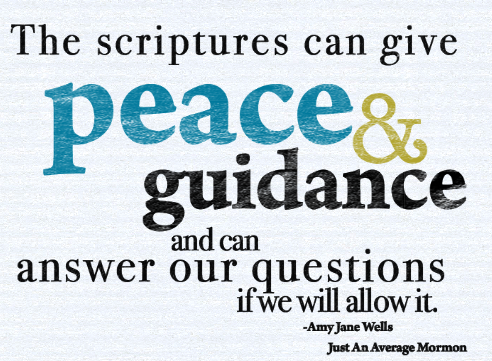 The scriptures can give peace and guidance and can answer our questions if we will allow it.